Hitting the Copacabana could soon become a more realistic aim for holidaymakers, with Norwegian set to become the first budget airline to operate UK-Brazil flights. The low-cost carrier will operate four weekly services between London Gatwick and Rio de Janeiro from 31 March 2019, putting it in direct competition with British Airways. BA are currently the only other airline flying non-stop between London and Rio, offering a daily service from Heathrow. Test bookings by the Press Association - for three return flights from London to Rio in April and May on hand baggage-only fares - found that passengers could book with Norwegian for between £480 and £540, compared with between £721 and £763 with BA. BA's flights include food and drink and a more generous hand baggage allowance, while Norwegian customers travelling on the cheapest tickets must pay extra if they want refreshments. Norwegian is also extending its South America operation by increasing its Gatwick-Buenos Aires flights from four per week to a daily service from December 3 "in response to customer demand". In October, the airline launched domestic flights in Argentina with two routes from Buenos Aires to Mendoza and Cordoba. Norwegian chief executive Bjorn Kjos said: "We're building on our expansive global network by launching the UK's most affordable flights to Brazil and making South America available to even more consumers. 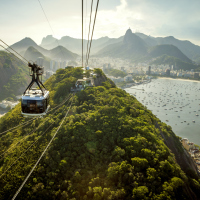 "Our new Rio de Janeiro route breaks the monopoly on direct flights between the UK and Brazil as we're committed to lowering fares and making travel more affordable for all holidaymakers and business travellers. "Brazil is a fantastic addition to our global network and we look forward to welcoming customers on board." Norwegian has shaken up the long-haul aviation market in recent years by offering flights at knockdown prices. Some of its most popular deals have included £99 transatlantic flights to New York. BA's parent company IAG acquired a 4.6% share in Norwegian in April and has subsequently made two takeover offers, which were rejected. IAG said it is "considering its options", while Norwegian insists it "remains fully committed to delivering on its stated strategy". If you're planning a trip to Brazil make sure you check out our dedicated Brazil travel insurance and give yourself peace of mind on the Copacabana.